I’m a Salomon type of Chica. 4 pairs in just under 2 years, in fact. 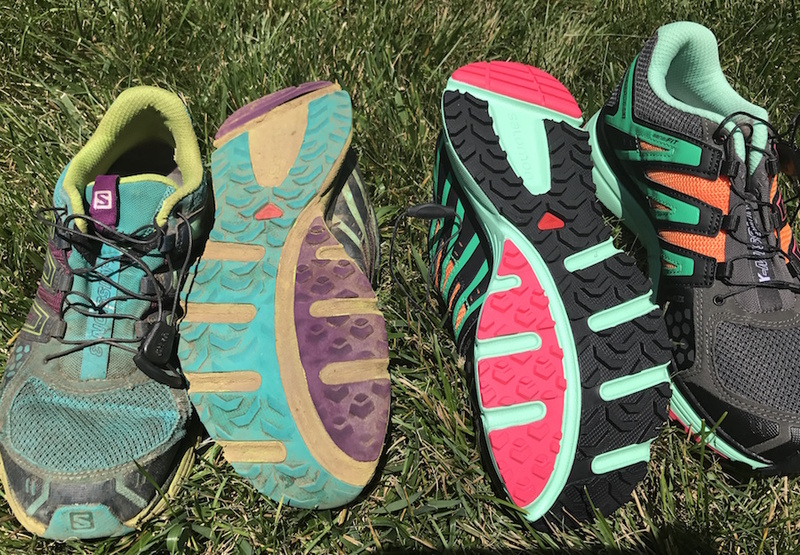 I first tried the Salomon XMission3’s when I was training-hiking in Costa Rica, and then in Wisconsin. I started my AT NOBO (northbound) thru-hike with my 2nd pair of XMission3’s (March, 2017). About 860 miles into my thru-hike, I was ready for my 3rd pair. My old 2nd pair and new 3rd pair. And finally, right before we started the NH White Mountain’s, I switched to my 4th pair. Always the same style – the XMission3’s – because for me, these are perfect. They are cushy and comfy, and have LOTS of room in the toe-box area (i.e. if you have bunions, this is a must! Also I think the extra room around my toes helped to prevent blisters). 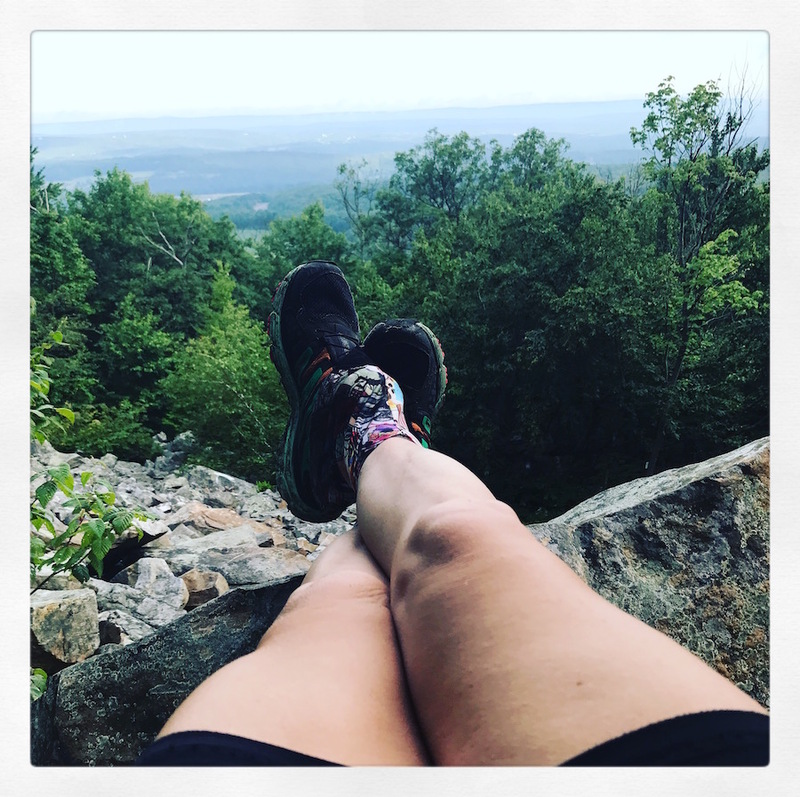 They are also very light-weight and dry out quickly after they get wet (anyone who has hiked the AT knows that you will get your shoes wet all the time, and it’s much better to have mesh shoes to take in water and let it out quickly, rather than a “water proof” pair of shoes. The waterproof shoes will eventually take in water, and then good luck ever drying them out, especially if they are leather hiking boots!). I wear a size 7 ½ – 8 shoe regularly, but my Solomon’s are a 9. Why a bigger size? Well, you’re feet will most likely swell when you hike all day, every day. It’s our feet’s way of telling us “hey, what the heck are you doing walking 20+ miles a day, are you crazy? I’m not used to carrying you this much all day long!” When I got fitted for my first pair of Salomon’s, I went to REI wearing my exact sock combo that I would be thru-hiking in (a pair of thin Injinji Liner Socks, with my light-cushion Darn Tough’s over them), and had them measure BOTH of my feet with my sock-combo on and told them my intent was the thru-hike the Appalachian Trail. 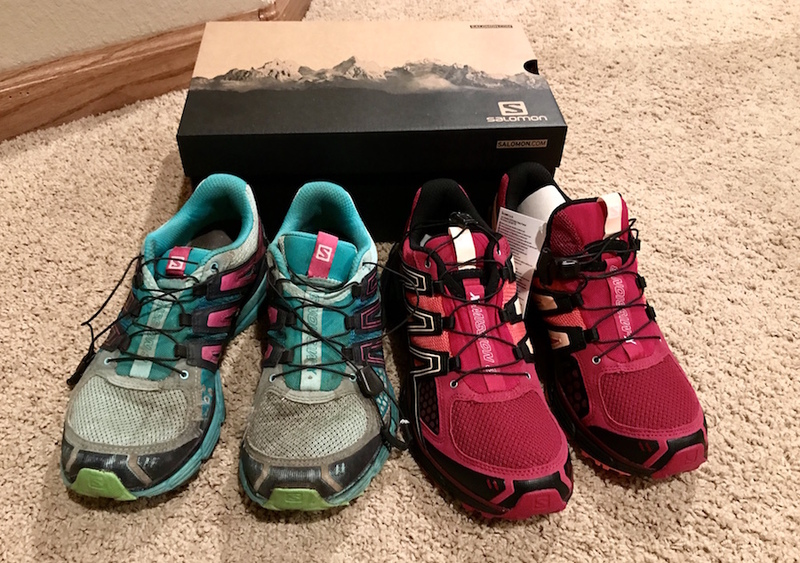 Anyway, it’s about time to get to the point of this post, which is – Salomon has amazing customer service! Salomon actually started out as a ski company, but now they have tons of running shoes, trail runners & hiking boots as well. They have a 3-year warranty on ski items, and a 2-year warranty on “everything else” (ah hem, my Salomon’s!). I’ve used this warranty twice now, within good reason, and I’m here to tell you about it. 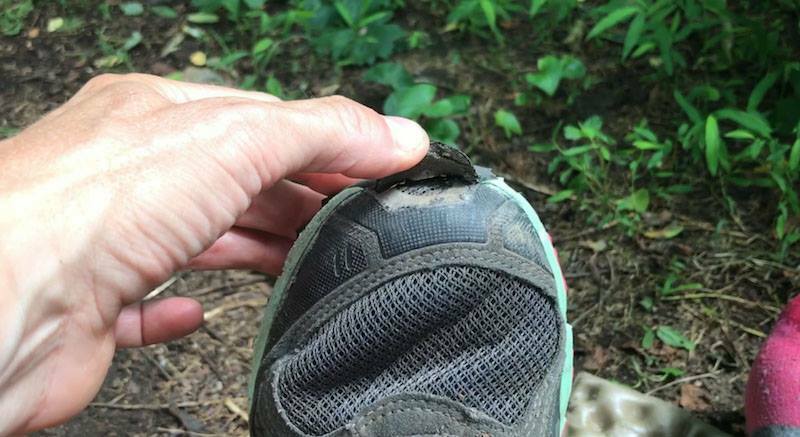 The first time I considered their warranty was with my 3rd pair of Salomon’s, which I started wearing at mile 860 on my thru-hike (Waynesboro, VA). I hadn’t been wearing them for 2 weeks, when the rubber flap that comes up from the sole and over the toes started to come unglued! I was shocked as this did not happen on my first two pairs. It was really annoying, as it flapped around a lot – I’d get grass and twigs stuck in it all the time, and sometimes I’d even trip (if you know me at all, you’ll know that it’s not hard to trip me up). I tried super glue at a hostel, which worked for about a day. Next I tried Shoe Goo, which is actually pretty awesome stuff. This held it for at least 4 days, and then I would have to re-goo it again. But that eventually got bothersome too. The shoes were in great condition except for this toe-flap. And then the flap on the other foot started to do the same thing! It was time to look into their warranty. I perused the Salomon.com website for how to contact them for a warranty claim. I mean, I thoroughly researched this, spending probably way too much time on their website. Bottom line – you can’t contact them or submit your claim online, you have to call them. Here’s something about me you may not know, I hate talking on the phone. 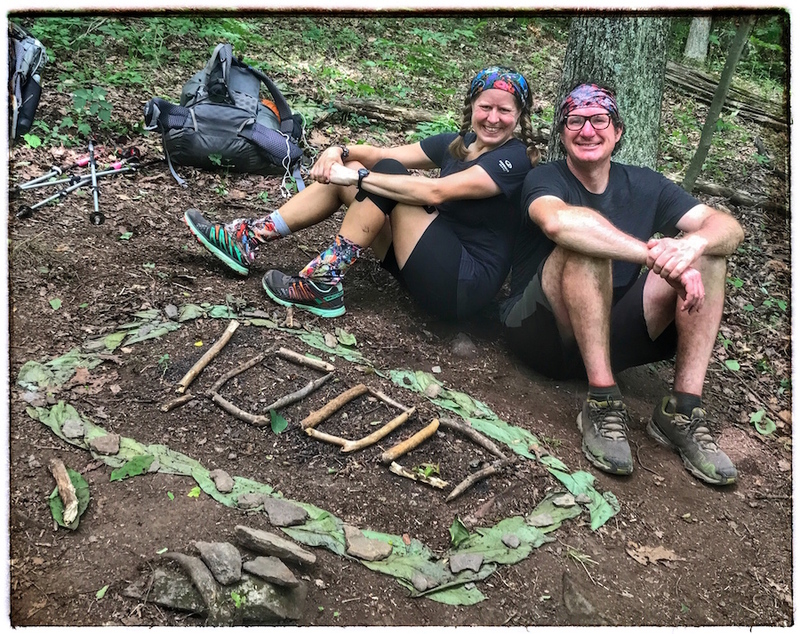 However, I can’t tell you just how much I had to talk on the phone on our thru-hike! It was one of my duties (my hubby and I split up the duties), and even though I abhor talking on the phone, I knew I would hate having to hang 2 bear bags every night, even worse. So talk on the phone I did – whether it was calling to make reservations at a hostel or a hotel, or calling Salomon to talk to someone about my shoes. You get a real person pretty much right away. They’ll ask you if they have a record of you (if you ordered from them directly before, give them your email), otherwise they will ask you if you have a receipt of our your purchase, and any other necessary contact information for you. Tell them what’s wrong with the shoes. They will then tell you that’s all they need and will be emailing you shortly. An email will follow outlining exactly what they need to start your warranty claim (usually: picture of problem area, pictures of soles of BOTH shoes, picture of the tag/size [inside the shoe], receipt of purchase if you did not purchase directly from their website). They’ll confirm they got your email and say they’ll get back to you within 7 business days. Most likely, they’ll get back to you the SAME DAY with “your warranty claim has been accepted!” They’ll give you a voucher credit code to use for a brand new pair of your shoes from their website (it will include everything, so cost to you will be ZERO!!). My old 4th pair (that I finished my thru-hike in) and new 5th pair (under warranty again, same problem!) – will save these for the Camino de Santiago we are wanting to hike in the fall of 2018! You can ALSO use the voucher code to buy a DIFFERENT pair of Salomon’s, the voucher will be worth a certain dollar amount, so if a new pair is above this amount you will just need to pay the different. Pretty great, huh? Especially if you’re on a thru-hike and need 3 or more pairs of trail-runners during your hike! Interested in what else I took on my AT thru-hike? Check out my end of hike gear list here. How did you use the “window insulation “ kit? Is it a reusable sheet or did you place it on your pad before you left? Curious ? Thank you! I couldn’t figure out if it adhered to the pad or you used it over and over. Thanks for the info!